Best party hostel I have ever stayed at, super professional staff, they helped me even more than I expected, a place run with love, and the most authentic atmosphere I've ever experienced, it is just incredibly easy to make friends and to talk to other travelers, there are parties every day at the bar, there's also a very nice swimming pool and a great club just 8 minutes away on foot, they also provide people with free dinner!!. Just perfect if you come to party!! Excelent people the best our business #Michelle, Lo nejor la Dueña #Michelle..
Really good hostel if you want to meet new people and have a good time with other backpackers! 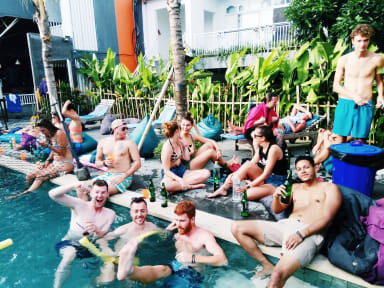 Great place to stay if you are looking to make friends and go for party, good atmosphere by the bar and kitchen area all very clean and tidy. Really nice place, super friendly staff, cool atmosphere. Excelente ambiente, un bar y pileta donde relajarla y conocer gente nueva. Me tuve que cambiar de habitación por temas personales en la reserva y me olvide las zapatillas en mi primer habitación, al otro día ya no estaban. The 6 bed deluxe dorm I slept in was not good. The beds were not beds, just mattresses in the floor, and my bed specifically was just below the aircon for the whole room so i was freezing every night. Got a flu because of that. The location is ok but as a girl alone I didn't feel safe walking to the hostel at night. The staff are nice but they won't tell you the information unless you ask them.